The Maximum-Strength Motivation Methods for Unmotivated Students Online Class has motivational methods that are so completely fresh, original and compelling, they work when ordinary methods draw only yawns from your students. In just one hour, you are going to learn dozens of inventive, must-have motivational methods that are designed to open the eyes of students who say they’ll never need school or an education because they’re planning on becoming a famous sports star, marrying a wealthy man, going on welfare, becoming a popular rapper, winning the lottery, or having their family always take care of them. These novel motivational methods are especially designed to work when conventional approaches fail. These exciting new tools presented in the Maximum-Strength Motivation Methods for Unmotivated Students Online Class offer you compelling, impossible-to-ignore methods that grab students’ attention and begin to chip away at their explanations for why they’ll never need school or education. The mo tivating techniques included in the information-packed Maximum-Strength Motivation Methods for Unmotivated Students Online Class are designed to work with students from Pre-K through Grade 12. You’re going to be “wowed” by the unexpected, cutting-edge methods you’ll learn to motivate children and teens to become prepared, motivated, interested students. The Maximum-Strength Motivation Methods for Unmotivated Students Online Class includes a full color workbook (shown above) of ready-to-use, printable motivational posters, plus motivating lesson plans and student worksheets. View video of workshop speaker and student motivation expert, Ruth Herman Wells, M.S. The workbook for the Maximum-Strength Motivation Methods for Unmotivated Students Online Class is stuffed full of ready-to-print, color posters that almost “trick” students into viewing education in a new light. There are also motivational lesson plans, and printable student motivational worksheets, plus other helpful resources. These printables are all ready to be printed, saved, and used immediately with students. All are designed to grab students’ attention and deliver your motivational message. A few examples from the Maximum-Strength Motivation Methods for Unmotivated Students Online Class workbook are shown below. Order the Maximum-Strength Motivation Methods for Unmotivated Students Online Classr now, and within seconds, you will be turning around even your most apathetic, bored, disinterested, and indifferent students. Awesome methods exist to motivate even your most unmotivated children and teens, and you can be using those more effective tools just minutes from now. This one hour webinar is delivered completely online on your computer screen, and you can view it on many other devices as well. From the time you order, to the time you watch the webinar, just seconds will elapse. We have so many wonderful motivational methods packed into a 60 minutes that it may be the most useful hour of your year. 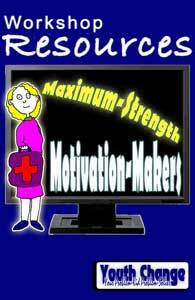 The Maximum-Strength Motivation Methods for Unmotivated Students Online Class offers you one free clock hour. You simply watch the one hour webinar then take a 10 question post-test and you’ve earned a clock hour. Clock hours are offered for teachers, counselors, social workers, psychologists, special educators, therapists, drug and alcohol counselors, nurses, and many others. We’re approved in many states for many disciplines, far too many to list here. Email Youth Change Workshops or call us at 800.545.5736 to check if we have the hours and CEUs you need. No one has better motivational methods than veteran trainer and author, Ruth Herman Wells, M.S. Ruth is your presenter for this online training seminar. You’re going to definitely agree that Ruth Herman Wells has some of the most cutting-edge, powerful intervention methods for unmotivated, bored and disinterested K-12 students. If you work with unmotivated, difficult, angry, absent, emotionally disturbed, ADHD, defiant, apathetic, or challenged children and teens, Ruth has your solutions. In 2011, Ruth was rated by both SpeakerMix and SpeakerWiki as one of the top ten K-12 education speakers in the U.S. She is also the Director of Youth Change Workshops. For the past few years, Ruth has been a popular, featured columnist for SEEN Education Magazine. Ruth is probably best known for her lively keynotes and breakout workshops at conferences, and for her trainings at schools, treatment centers and agencies. You also can read attributed comments that past workshop participants have written to Ruth about her popular, professional development webinars and continuing education trainings.